Dundee’s Faissal El Bakhtaoui is convinced he can still make it in the Premiership, but is happy to have the chance to prove himself all over again at Dunfermline. The Frenchman left Tayside for the Pars on a season-long loan last month after becoming increasingly frustrated with his lack of game-time at Dens Park. The striker insists his opportunities in his favoured central striking role were all too rare under Neil McCann and this term was unlikely to be any better. Speaking ahead of tonight’s IRN-BRU Cup clash away to Inverness Caley Thistle, he said: “I’m happy to be back at Dunfermline. This was my first club when I came over to Scotland and I learned so much at this club. “That’s why I was thinking with my family about coming back here and I think I’ve made the right decision. “The fans here are unbelievable and it’s a big club, a club that should be at a higher level in Scotland, and hopefully we can have a good season. “I have come back a better player, with more experience. I learned so much in the Premiership, even though I was a bit frustrated at Dundee. “The system we played at Dundee didn’t help me. We were playing just one up front and I was playing as a second striker and on the left wing and the right wing. “I was happy to play, I was happy to get a game, but I don’t think it was my right position. El Bakhtaoui has scored twice in four games so far for the Pars but was unable to help them as they lost for the first time this season in Saturday’s 3-1 home defeat to title rivals Ross County. 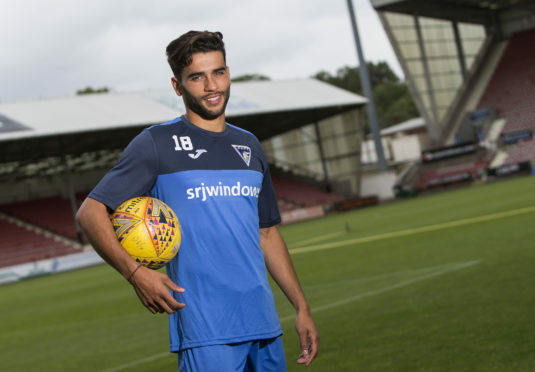 They face Highland opposition for the second time in three days tonight and El Bakhtaoui is hoping to repay the support he has received from the Dunfermline supporters by bringing success to East End Park.